There's nothing quite like a melon salad in the summer...paired with a burger fresh off the grill or alongside a weekend brunch. Jason created a "special sauce" that will make your tastebuds water. Click on over to Waiting on Martha for the details and full recipe. This Sunday is Mother's Day... Like many of you, I have memories of making breakfast in bed for my mom... or at least attempting it. It can be such a special day when you have little ones. It can also be very painful for those who have experienced loss or are waiting for a child of their own...our prayers go out to you. May you find an extra ounce of peace and hope this weekend. Last year we did a Mother's Day photoshoot for Pottery Barn, and we never blogged the images (or recipe). 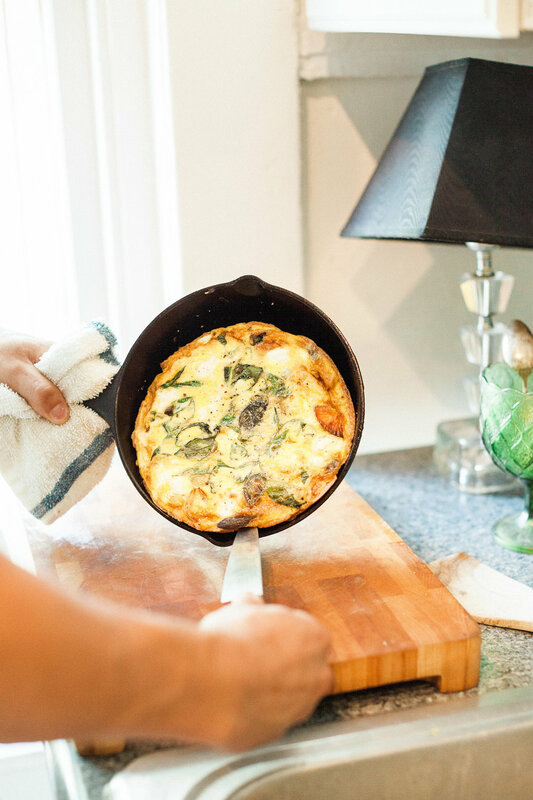 Jason prepared this wholesome potato frittata that's fitting for mommy-dearest. Be sure to let us know if you prepare the frittata...post on Instagram and use #HomespunATLatHome. Heat a large 10” nonstick or well seasoned cast iron skillet on medium high heat. Render the sliced bacon for about 4-5 minutes until browned. Remove bacon from pan and set aside on paper towels. Reserve bacon fat for cooking. 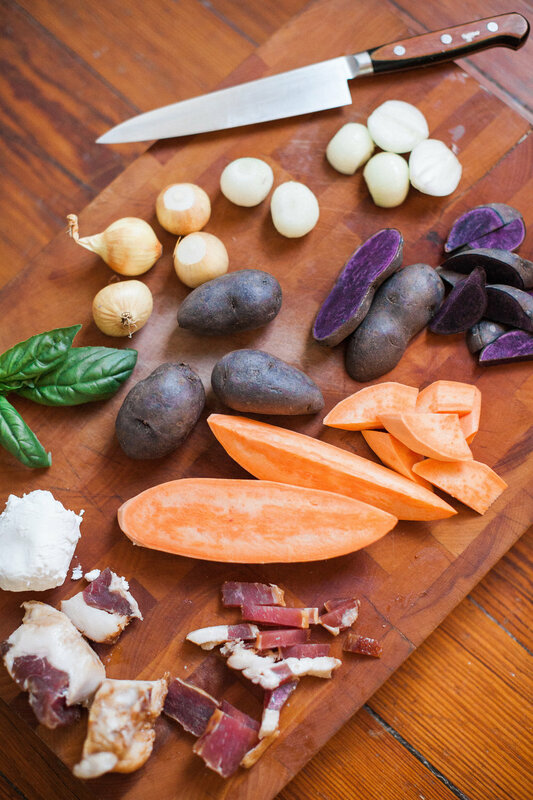 While pan is still hot, add diced sweet potatoes and fingerlings to the pan. Using bacon fat, cook potatoes until nice and tender. Stir occasionally to cook evenly- this will take about 8-10 minutes. Once potatoes are almost done, add onions and remain cooking until they are tender for 2-3 minutes. While potatoes and onions are cooking, whisk together 6 large eggs. Season with salt and pepper. 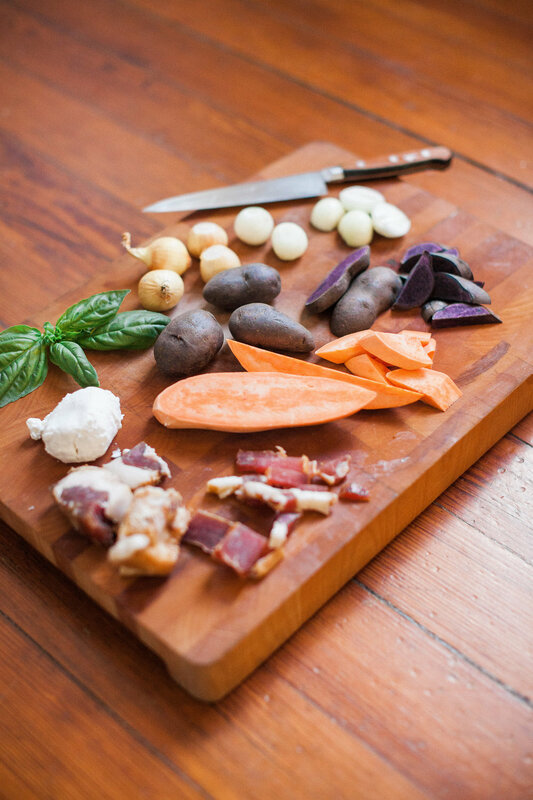 Once potatoes and onions are done, mix in bacon pieces and basil. 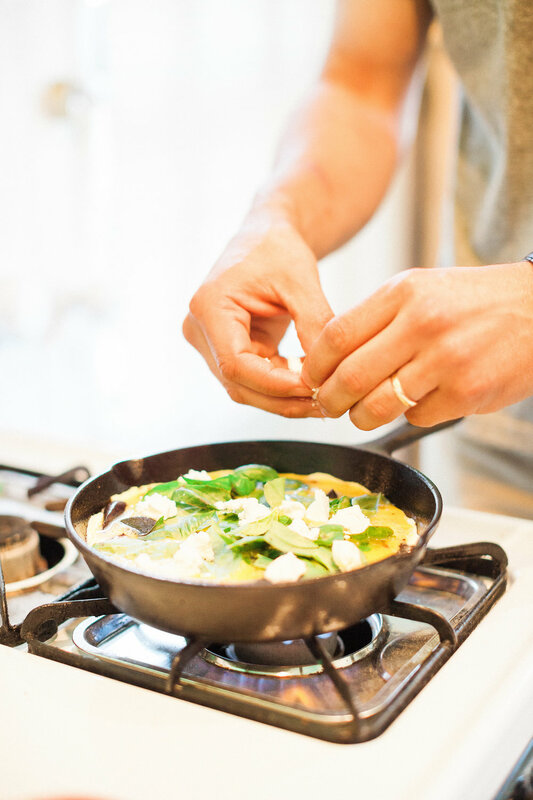 Lower the temperature of the burner to low and pour eggs over the top of the veggies in the pan. Arrange goat cheese over the top. Cook until the eggs begin to set around the edge. The middle should still be a bit runny. Place the frittata in the oven and cook for 5 minutes or until the middle has set. 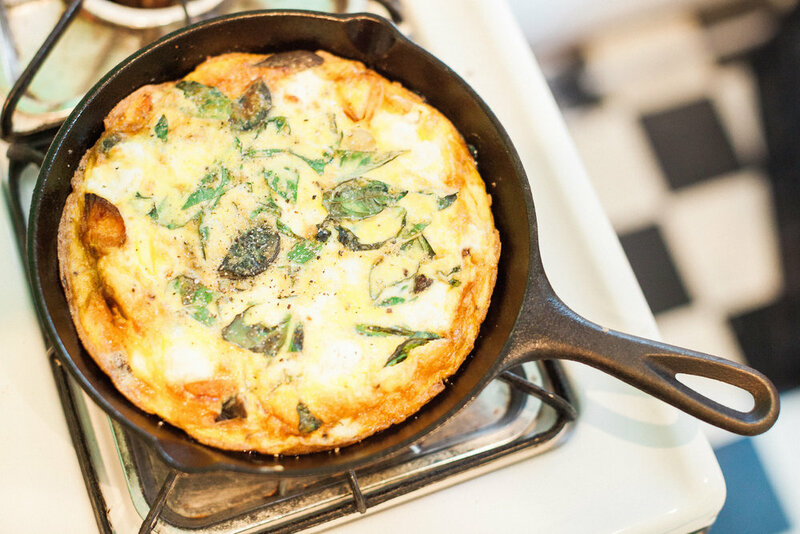 Once the frittata has finished, let it rest in the pan for 5 -10 minutes. 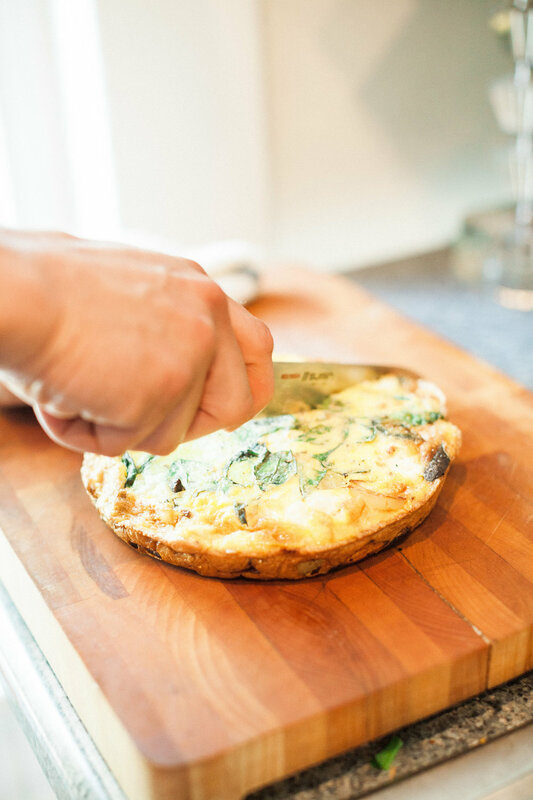 Slide frittata onto a cutting board and cut into wedges. 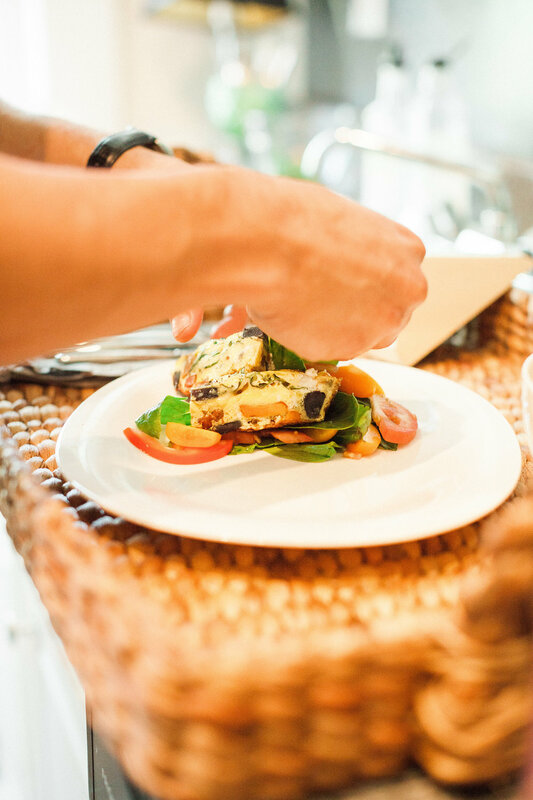 You can serve the frittata with a nice green salad with fresh tomatoes and basil, lightly dressed with good EVOO and vinegar. Be sure to visit the Pottery Barn blog for Juli Vaughn's granola and morning punch recipe. 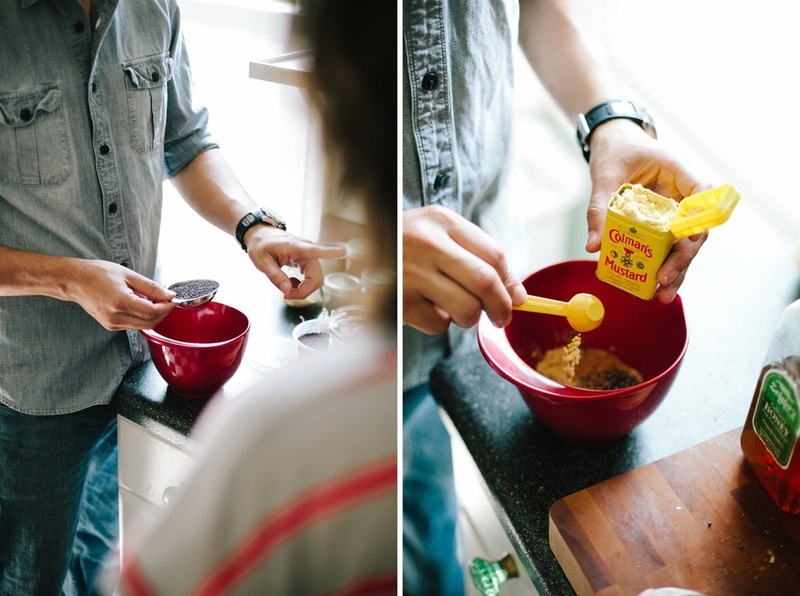 Our friends over at Camp Makery are also sharing the recipes. Happy St. Patrick's Day! 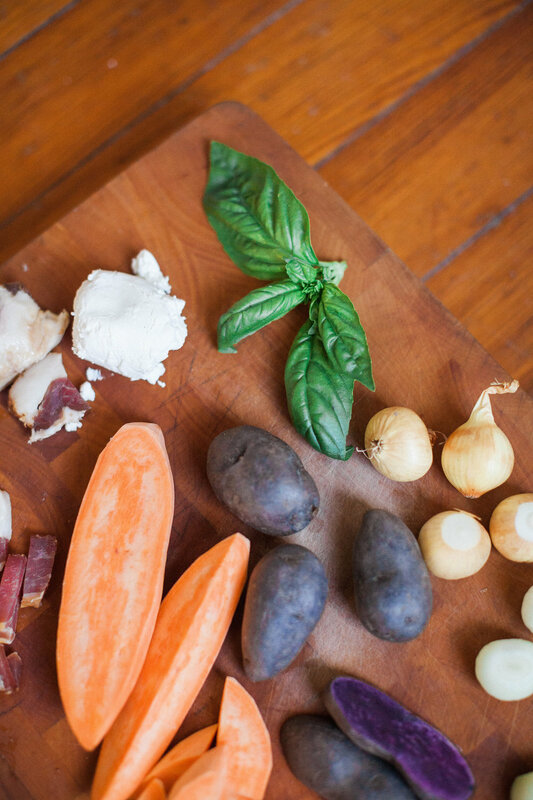 Though most just think of cornbeef and beer, there are plenty of ways to celebrate this Irish holiday with delicious food. We put together this menu for an editorial with Cottage Hill Magazine. You can see more photos from their journal post yesterday, and today they are sharing our Irish Cream Bread Pudding Recipe along with a video from Hampton Roads Studio (watch below). We, too are planning all the "food" for next week's festivities! To provide a bit of inspiration as you making that grocery list, here is the menu from our Woodland Wonderland with Mandy of Waiting on Martha, featured in Rue Magazine. This past week, Mandy has been sharing the recipes. Click on over to her blog, and give them a try. If nothing else, make the creme brulee... you will not regret it! You can also view the full gallery of the dinner, shot by Rustic White. Enjoy! Also, for you locals... have you been to the Waiting on Martha Pop Up Shop at Shops Around Lenox?!? It's amazingly curated and perfect for (last minute) holiday shopping! We are honored to be featured in the second volume of Trouvé Magazine. Volume 02 is a collection of stories and creative interviews centering around the theme of "Creating With Intention". The images featured are from the talented Paige French from a gathering last year. 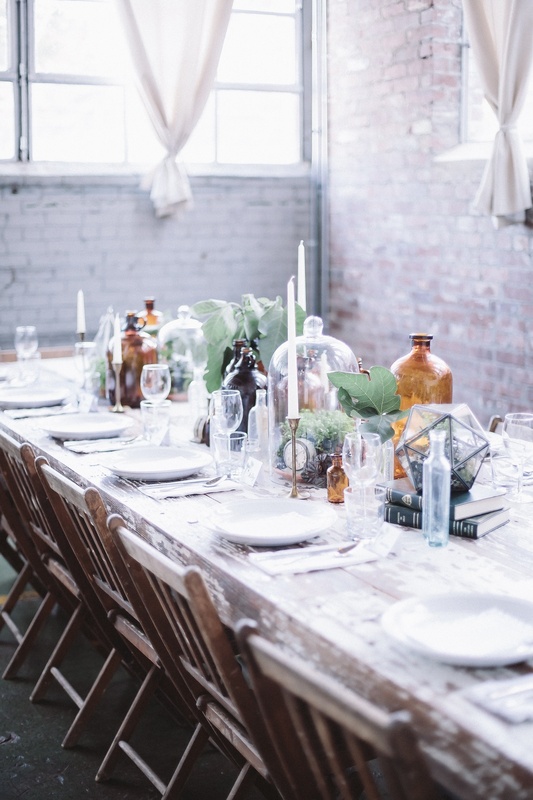 Blue Eyed Yonder did an amazing job styling and furnishing to create an inspiring table at Matchstic. Thank you to Melissa Afable for beautifully writing our story and Trouvé's editor, Amanda Marko for including Homespun and putting so much thought and intention into the magazine. I mean, have you seen how each issue is packaged?! Does that hummus catch your eye? 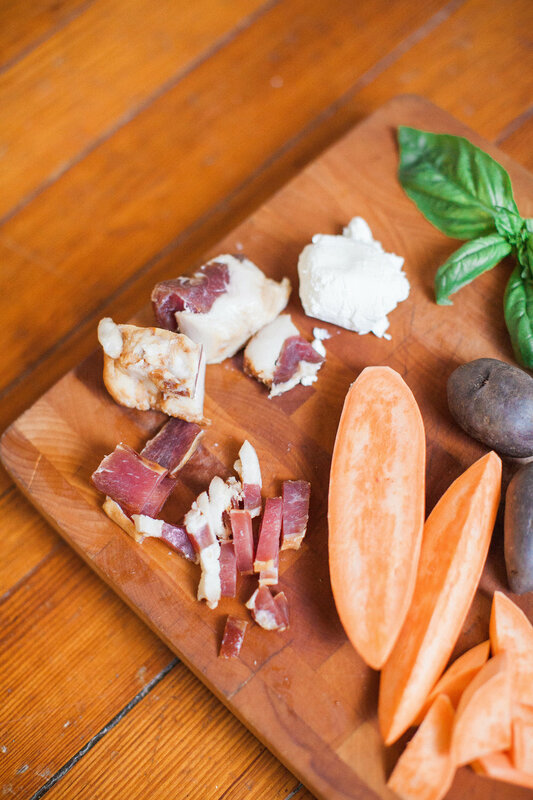 Visit the journal on Trouvé's website for the recipe. PS- There is still time to order a copy for holiday gifting. You have until Friday. Cover Photograph & Promotional Photography by Jessica Scott. Gathering Photography by Paige French. Who doesn't dream of a holiday getaway at a secluded cabin?!? We had so much fun working with Mandy of Waiting on Martha to create this wholesome meal for the dreamy festive affair she put together. Head on over to page 102 of Rue Magazine's holiday issue. You can also find all the recipes for the meal. Start that Christmas Dinner planning! Strain beans and rinse well. Place in pot and cover with water and begin to boil. Until very tender. May take up to an hour. 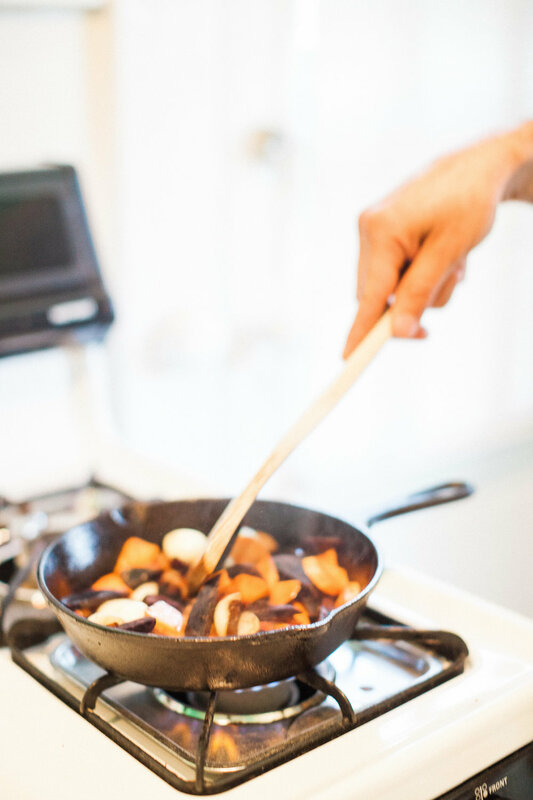 While beans are cooking, roast butternut squash in a pan with a 1 T of oil to caramelize. Once caramelized add into a pot along with garlic, and cumin. Once all ingredients are tender strain and reserve the liquid for pureeing. While the ingredients are still hot place in a mixer/ food processor with a little liquid to help puree. Your hummus will come out very smooth if you blend while hot. Refrigerate up to one week. To serve, garnish with olive oil and pumpkin seed gremolata and serve with crostini, cut veggies, or crackers. Last week we worked with several of our favorite creative to provide inspiration for a Harvest Dinner Gathering. We encourage you add rich, deep florals paired with pumpkins on your table, forage colored leaves for place cards, and set out the shiny china. We adore this hostess look with an Ice Milk Apron, and did you know those striped linens will be on our new shop later this month?!? Stay posted for our new website and online shop. This past weekend, Jason had the honor of sharing a recipe from the Kitchen Stage at the Country Living (Magazine) Fair at Stone Mountain Park. As you may be well aware, our approach to food is seasonal- allowing the produce speak for itself and simply bring out its natural flavor. With the holidays around the corner, this dish is sure to be a crowd pleaser and provides an untraditional preparation for the beloved sweet potatoes and brussels sprouts. We recommend serving with Roasted Turkey, Chicken, or Pork. Enjoy! Add butter, sorghum*, and stock. Season with salt and pepper and rosemary sprig. Allow to come to a boil and then place in the oven for about 8-10 min. If you can't source sorghum you can substitute with honey or molasses syrup. 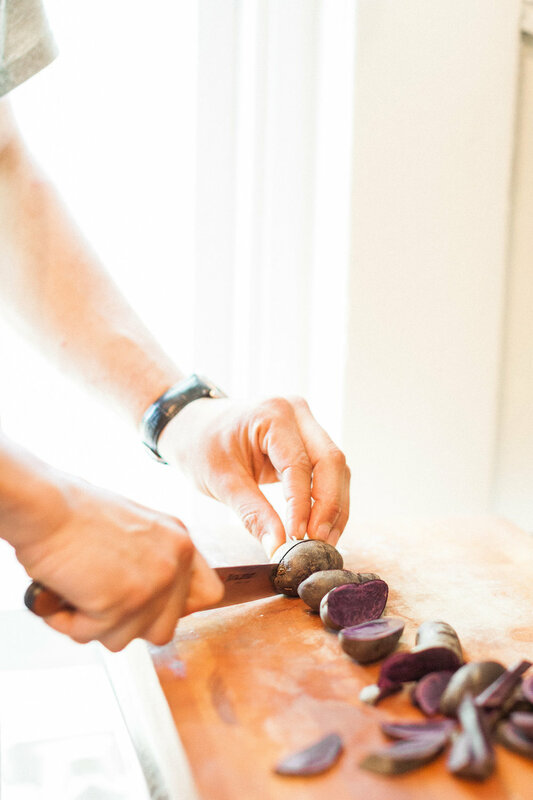 Once sweet potatoes are tender carefully remove from oven and flip sweet potatoes over. Place pan back onto the stove and reduce to glaze the sweet potatoes. Once glazed, set aside to reserve. * This step can be done before and reheated in the oven for 8 - 10 minutes before serving. Begin heating up a large saute pan over medium heat. 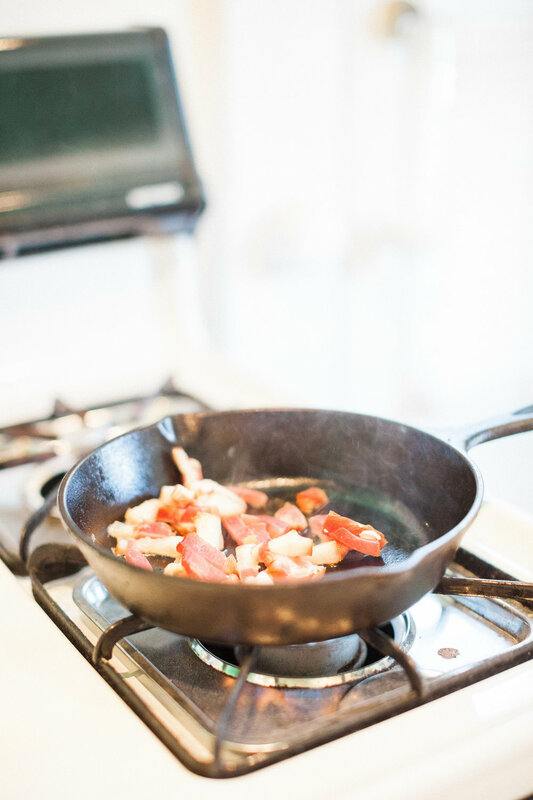 To begin sauteing, add grapeseed oil and brussels bulbs to caramelize. About 2-3 minutes. Then add butter, apples, onions, and garlic and cook for 3-4 minutes. Be sure to stir and rotate veggies periodically. Stir in brussels leaves then add stock. Season with salt, black pepper, and drizzle sherry vinegar. Spread apple butter on the bottom of a large platter. Fill the dish with sautéed brussels and apples, top with glazed sweet potatoes and garnish with chopped parsley (as seen in photo).